Brian Black worked prodominantly fo the Massachusetts-based Chaotic Wrestling promotion..
April 19, 2003–Chaotic Wrestling: Brian Black & Mighty Mini defeated Kevin Matthews & Danny Demanto..
August 9, 2003–Chaotic Wrestling: Brian Black defeated Dukes Dalton in Tewksbury, MA..
August 23, 2003 – CW: Brian Black & The Mighty Mini defeated Attrition for the Tag Team titles..
March 12, 2004 – CW: Brian Black & The Mighty Mini defeated Brian Buffet & Peter Mulloy for the Tag Team titles! April 30, 2004 – CW: Brian Black won the vacated New England title by outlasting 27 other competitors in a Royal Rumble match..
~~~Afterwards, Brian Black defeated Luis Ortiz which caused Ortiz to attack Black with a chair and destroy the New England belt..
June 25, 2004–Chaotic Wrestling: Brian Black defeated Adam Booker in Lowell, MA..
September 17, 2004–Chaotic Wrestling: Brian Black defeated Luis Ortiz..
October 8, 2004–Chaotic Wrestling: Brian Black defeated Andre Lyonz..
January 6, 2005 – Smackdown! : Brian Black faced Kurt Angle on an edition of SmackDown! in a Kurt Angle Invitational..
January 8, 2005–Chaotic Wrestling: Brian Lilonas won four-way over Fred Sampson and Arch Kincaid and Brian Black..
~~~~~~~~~~~~~~~~~~~~~~~Later that night, Brian Black won a Battle Royal..
February 18, 2005–Chaotic Wrestling: Arch Kincaid defeated Brian Black..
March 18, 2005–Chaotic Wrestling: Brian Black defeated Maverick Wild to win the Chaotic Heavyweight title! March 10 2005: Brian Black signed a developmental contract with World Wrestling Entertainment..
May 2, 2005 – RAW: Todd Hansen defeated Brian Black in a dark match..
August 25, 2005 – Smackdown! : Brian Black debuted as a character known as Palmer Canon, a representative from “The Network”..
~~~Canon’s first act was to cancel a Ligerie match between Stacy Keibler & Christy Hemme, which didn’t make the fans happy! September 1, 2005 – Smackdown! 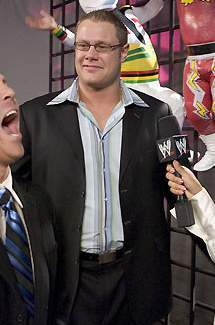 : Palmer Canon apologized to Stacy and Christy and booked them in a traditional wrestling match..
September 1, 2005–Deep South Wrestling: Palmer Canon appeared and said he was there to scout talent for Smackdown!.. September 15, 2005–Deep South Wrestling: Kane (returned from a long hiatus) choke slammed Palmer Canon..
September 16, 2005 – Smackdown! : Palmer Canon underminded GM Long’s authority and named Eddie Guerrero as #1 Contender! 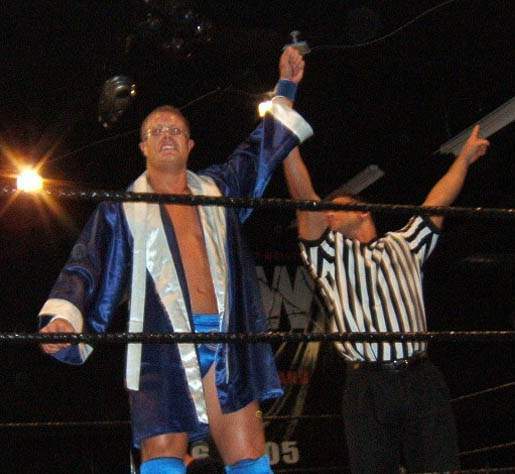 October 13, 2005–Deep South Wrestling: Palmer Canon defeated Ox Hazzard..
October 14, 2005 – SD! : Palmer Canon introduced The Boogey Man who cut a creepy promo and smashed a clock over his head..
October 20, 2005–Deep South Wrestling: Jack Bull defeated Palmer Canon by Disqualification..
October 21, 2005 – SD! : Palmer Canon continued to introduce “new talent” by introducing the addition of the “Junior” Division..
October 27, 2005–Deep South Wrestling: “Silverback” Ryan Reeves defeated Palmer Canon by Disqualification..
November 3, 2005–Deep South Wrestling: Mike “The Miz” Mizanin defeated Palmer Canon..
November 23, 2005–Deep South Wrestling: Tony Santorelli defeated Palmer Canon in the 1st round of the DSW Title Tournament! November 27, 2005 – Survivor Series: Theodore Long w/Palmer Canon defeated Eric Bischoff with help from The Boogeyman! December 1, 2005–Deep South Wrestling: Palmer Canon defeated Lash Leroux..
December 15, 2005–Deep South Wrestling: Palmer Canon defeated Antonio Banks..
January 26, 2006–Deep South Wrestling: Derrick Neikirk defeated Palmer Canon to retain the DSW Heavyweight title..
February 9, 2006–Deep South Wrestling: Palmer Canon interrupted a Bikini Contest until Tommy Dreamer showed up to save the day! ~~~Palmer Canon (w/Angel Williams & Trenesha) defeated Tommy Dreamer (w/Michelle McCool & Tracy Taylor & Kristal Marshall)..
~~~~~~Freakin Deacon helped Palmer Canon beat down Tommy Dreamer until Giant Dalip Singh debuted to chase the heels away..
March 2, 2006–Deep South Wrestling: Palmer Canon (Who claimed Dalip Singh would join his faction) defeated Antonio Mestre..
March 9, 2006–Deep South Wrestling: Antonio Maestre defeated Palmer Canon in a special 6-minute challenge match..
~~~Canon had six minutes to pin Mestre twice but failed within seconds. Dalip Singh attacked Mestre and left with Canon! 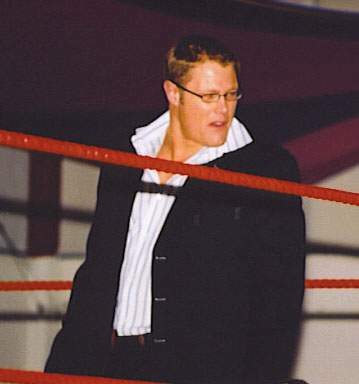 March 16, 2006–Deep South Wrestling: Ray Gordy defeated Palmer Canon with Nick Patrick (Assassin’s son) as referee ..
~~~Palmer Canon had the match won but Nick Patrick faked a shoulder injury to “screw him” to get revenge for Assassin..
~~~Later on, Palmer Canon got Freakin Deacon & Dalip Singh to “sacrifice” Nick Patrick and put Deacon’s spider on him..
March 23, 2006–DSW: Palmer Canon (w/Dalip Singh & Freakin Deacon) beat Antonio Mestre with Matt Striker as referee..
April 20, 2006: Palmer Canon quit the WWE while on tour with Europe, flying himself home midway through the tour..
~~~Reports circulate suggesting that the sudden departure was due to a “hazing incident” that involved JBL..
~~~~~WWE management is going out of their way to change Palmer Canon’s mind to being him back to Smackdown!.. 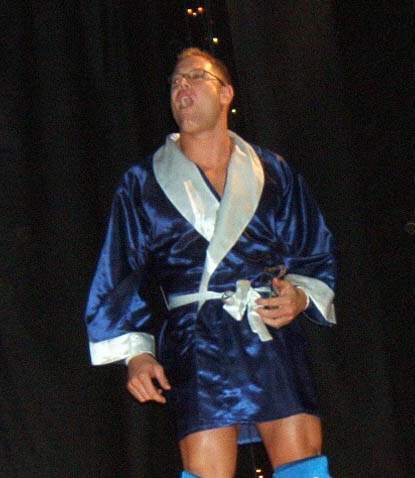 April 27, 2006–Deep South Wrestling: Teddy Long showed up to “ban” Palmer Canon from Deep South and “rehired” Nick Patrick..
May 18, 2006–All Out Mayhem: Palmer Canon defeated “Boston Bad Boy” Jason Rumble…. October 21, 2006–Eastern Wrestling Alliance: Antonio Thomas vs Brian Black ended in a No Contest..
November 11, 2006–All Out Mayhem Wrestling: Tito Santana defeated Palmer Canon in Machias, Maine..
December 1, 2006–Chaotic Wrestling: Fred Sampson & Brian Black defeated Pretty Psycho (Handsome Johnny & Psycho)..
December 2, 2006–All Out Mayhem: Frankie Armadillo defeated Palmer Canon in South Portland, Maine ..
August 2008: Brian Mailhot made his MMA debut in Plymouth, Massachusetts winning his fight over Tony Rea via slam. November 20, 2010–All Out Mayhem: Palmer Canon defeated Captain Freedom to win the AOM Heavyweight title..
~~~LATER: “The Living Legend” Larry Zbyszko defeated Palmer Canon to win the AOM Heavyweight Championship!